The GE Voluson line of ultrasounds remain in high esteem for their image quality and ease-of-use, but for one of the leading and most professional and dynamic ultrasounds from this line, look no further than the GE Voluson e8 ultrasound. This ultrasound system is designed to keep pace with busy and growing clinical practices, and it can handle routine women’s health exams and complex imaging exams with relative ease and precision. Using the innovative Radiance System Architecture, the GE Voluson e8 ultrasound emphasizes clinical efficiency and workflow flexibility to give physicians the best results for their setting and applications. Moreover, this system is designed to enhance the physician’s diagnostic confidence with superior image clarity and speed. 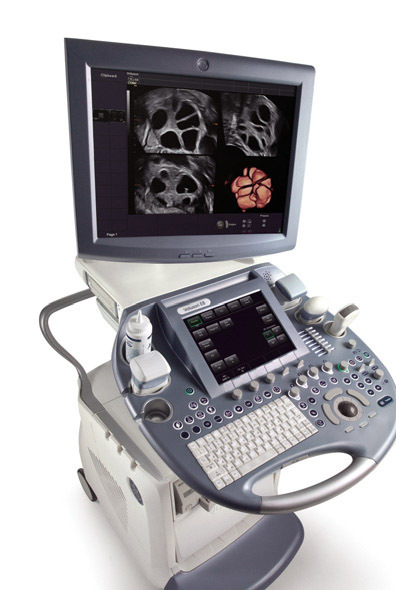 Additionally, some versions of the GE Voluson e8 ultrasound include HDLive imaging, which provides a new way of viewing 4D imaging. The HDLive provides a virtual light source, which can be “moved” by the user to provide shadows on the face, giving it a very realistic view of the baby. We’ve always loved the Voluson ultrasound machines for their innovative technologies, excellent image quality in its modalities, and ease-of-use. The e8 set a new standard for image quality, improving penetration, and easier-to-use features over all other 4D ultrasound machines. This is a highly recommended machine for those looking for premium OB/GYN image quality. A refurbished GE Voluson e8 can be found at a very good price.